A simple Guide to Jazz Fest. A simple Guide to Jazz Fest . Here is a simple guide to packing for a wonderful JazzFest. • Pack light. You don’t need much. A few light clothes and a rain jacket. • Comfortable shoes that you don’t mind getting muddy. Keens or sneakers are great. You walk a lot. • Tickets. Pick your days. Do it your way. There is no right way to enjoy the festival. 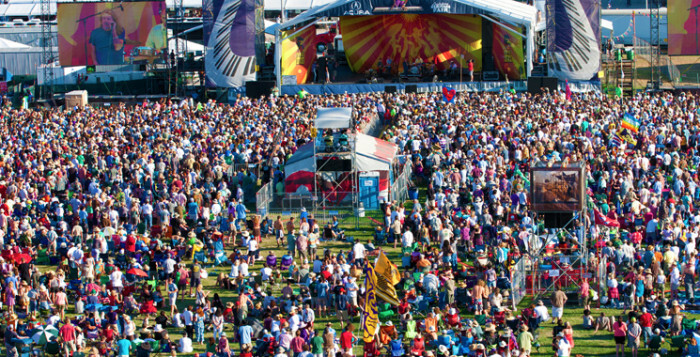 • Smart phone w the Official Jazzfest App – Gives the grids and schedules, maps and updates. • Sunscreen. It’s HOT and sunny in Louisiana! • You need a Hat!! • A folding chair…We use a little tripod seat. If you bring a blanket it will likely get stepped on. • An appetite. You’ll get some of the best of New Orleans at the fairgrounds. • Cash- You will want some money for food, drinks and souvenirs. Bring a couple hundred dollars – preferably in smaller denominations. I’ll be just take my Osprey backpack as a carry-on and using my Gobigear Hobo-roll as a daypack.